"Sean, you need some help?" As President Donald Trump honored the Patriots at the White House Wednesday, Rob Gronkowski interrupted Sean Spicer, a New England native, during his White House press briefing. Rob Gronkowski crashed the White House press briefing on Wednesday, drawing laughs from the surprised press corps. Press secretary Sean Spicer's briefing had been going on for about 20 minutes when the tight end opened a door and poked his head around the corner of the dais. “Sean, you need some help?” Gronkowski said. “I think I got this, but thank you,” Spicer responded. 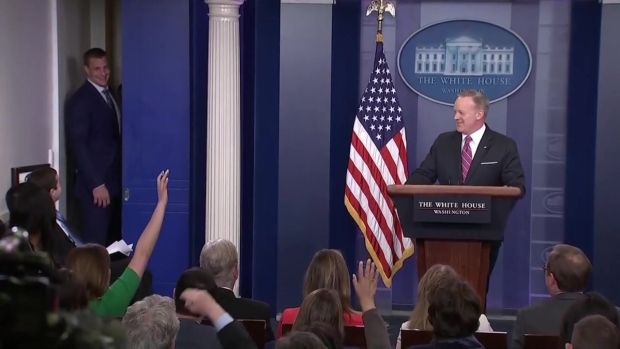 Patriots tight end Rob Gronkowski takes time out from the team's visit to the White House to interrupt White House Press Secretary Sean Spicer's press briefing. Gronkowski's surprise appearance got a loud laugh out of the assembled media. Spicer kept his composure, though, quickly returning to the subject at hand. "That was cool," Spicer, who is a big Pats fan, said with a laugh. "How do you follow that?" Gronkowski's New England Patriots were at the White House to accept congratulations from President Donald Trump for their Super Bowl victory.